For a lot of guys, figuring out how to match clothing can feel confusing. For instance, Does this red sweater go with this green jacket or will I look like a Christmas tree? Or, Can I wear a patterned tie with a patterned shirt without causing seizures in my co-workers? Some guys even think colors should be worn only in the warm weather months. Still others stick to a monochrome palette in their wardrobes not because they love neutrals but by default; they’re simply too freaked out to wear anything else. They don’t want to get it wrong or look like a walking Crayola box. If this sounds like you, know you’re not alone. While figuring out how to match clothing can feel tricky and intimidating, Style Girlfriend’s got you covered. Read on to discover how to incorporate more colors and patterns into your wardrobe (almost) effortlessly. We’ve been using the word match, but truth be told, incorporating more color into an outfit is more about complementing colors than outright matching them. Matching your jacket to your shirt to your socks to your shoes with the exact same color is not what we’re going for. You wind up with serious color overkill and a “trying too hard” vibe. Not good. Instead, start small. Add one element of color for some pop to an outfit – a yellow pocket square, a purple scarf, an orange tie. Keep the rest of the outfit neutral, which will play up the contrast. Pops of color only work when they have something to pop against. Sticking to a neutral colors for the rest of your outfit will make your “pop” more effective. Think: black, navy, grey, brown, and olives. Anchoring your look with solid neutral-colored items (like your shirt, jacket, and pants) will break up the bolder pop of color in your outfit. Plus, it gives that color (or pattern) some space, visually-speaking, to do its own thing. Stick to just one pop. No need to go crazy (not yet, anyway)! Incorporating one color into an outfit comes off as very sophisticated, and not as difficult as you would think. Ready for the next level of adding color to your outfit? Awesome. Keep things simple by adding another bright piece in the same color family. The trick? The second item shouldn’t be the exact same hue as the first. When you add more color into your outfit in different tones, it reduces the contrast. That “Whoah, this is…a lot of look” feeling you may have gotten in the past when trying to match colors. With less contrast, you’re on your way to a look that feels sophisticated, not loud. You want examples? You got it. How about pairing a dark army green bomber jacket, for instance, with a grey-ish olive chelsea boot? Or you could rock a mustard yellow sweater without looking like a walking yield sign by pairing it with darker tan chinos. You could also mix a button-front shirt, corduroy pants, and boots that all have hints of red and brown. With this handy trick of adjusting the intensity, you’re well on your way to seamlessly matching colors like a pro. Remember when we said that it’s not about matching, it’s about complementing colors? Let’s get more into that. Once you’re more comfortable wearing different intensities of the same color in your outfit, it’s time to get more advanced by mixing in a complementary color. Barron Cuadro over at Effortless Gent talks about how he loathes the color wheel as a guide…and we do too, honestly. You’re just trying to put an outfit together, not get an art history degree! However, it can be helpful when thinking about color combinations that won’t give whoever’s looking at you a headache. Now, if you’re thinking, “Hmm, I don’t know, some of those are my favorite team’s colors and I wouldn’t wear my jersey to the office,” we hear you. “Simply put, complementary colors are on opposite sides of the color wheel from each other. This means they’re high contrast pairs, so, the key to using two complementary colors and without looking like a clown is to make one of them a darker shade. For example, if you want to wear green pants and a red shirt (and it’s not Christmas, and you’re not going to a holiday theme party), simply wear olive or forest green chinos. #4 When in doubt, do just one pop of color…but make it big! A killer sportcoat in a bold blue, a winter sweater in a richly-hued burgundy, or even pastel pants at a summer wedding with a white linen shirt on top…all are great ways to introduce a pop of color to your outfit while keeping everything else simple. Just remember, if you’re nervous: start small, less is more. Of course, if you’ve got a closet full of neutrals, you’ve already got your foundation. So, how about a crimson red sweater with a navy patterned shirt and dark denim? Or a emerald green scarf with a tan trench coat. The possibilities are truly endless. Now, we hear questions about the details all the time. “Do I need to wear black socks to work? What color should my belt be if I’m wearing dress shoes that the box calls “aubergine?” And that’s good! The devil truly is in the details, and you want to wear one hell of a look. So it’s good to remember that knowing what colors to wear doesn’t end at your clothes. Got that? Browns with the brown family (that includes you, aubergine), and black accessories and shoes with like. It’s also important (though perhaps less so than with shoes and belts) for the jewelry you wear to…if not match, at least not clash in an unappealing way. Some folks solve this by wearing a two-tone watch to ensure they can wear either silver or gold with the rest of their look and still have it all tie together. Not to make any broad assumptions, but so long as you don’t wear too much jewelry—perhaps a wedding band and a watch is the most you have on in a given day—you probably don’t have to worry too much about this. Want the short answer? Just match your socks to your pants. As the folks over at Bespoke Post point out, “You’ll create a visually seamless extension of your leg that’ll make you appear taller. Matching doesn’t mean identical colors, though; they just need to fall in the same hue.” As you can see in the pictures above, that doesn’t mean you have to look boring. The polka dot and windowpane patterns look stylish and complement the wearers’ pants. Win-win. Oh, if you are going to branch out with a bold or colorful pair of socks, just make sure the rest of your outfit is on point. 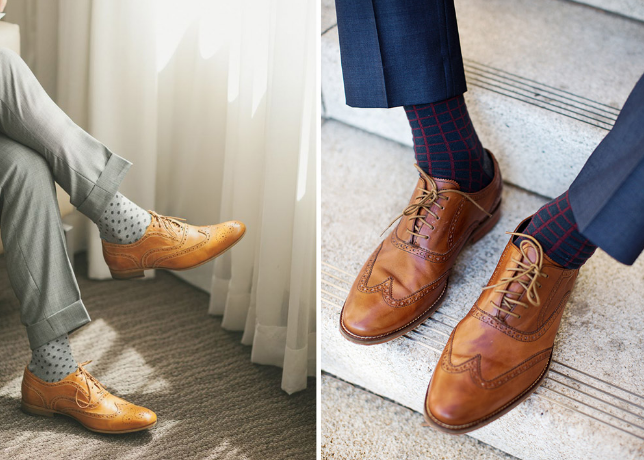 It should go without saying, but…bright red socks with impeccably tailored dress pants and polished double monk strap shoes looks very different than bright red socks with sloppy faded bootcut jeans and grass-stained New Balances. Ready to graduate from mixing solid colors to mixing patterns? Let’s do it! Patterns that are the same size can compete for attention, so the biggest thing to remember is to mix up the scale to help create contrast and really define each piece. Give a thick plaid check some room to breathe by opting for a thin striped shirt. Busy prints like pants in camo can be balanced out with a large, color-blocked sweatshirt. Want to keep things a little separate from your outfit? Consider patterned bags, scarves, or other accessories for a bold style move that won’t clash. For guys who work in a more corporate environment, having some fun mixing your shirt and tie color and pattern combinations can be the most you’re able to do to break out of the “corporate” uniform. That’s great, though, because there’s practically endless combos available. Here are some tips to keep in mind with each of them. You don’t need to resort to layering solids on solids unless you’re pairing a solid white shirt with a solid black tie (or are aping Regis Philbin’s style from his Who Wants to Be a Millionaire days, and even then…). Do: Pair a patterned shirt with a patterned tie as long as the patterns are not the same or similar sizes. That means, wear a small check on the shirt with a large stripe or check on the tie, or a small stripe on the shirt with a large stripe or check on the tie. Don’t: Pair a shirt and tie of the same pattern. Meaning? If the shirt is a vertical stripe pattern (large or small), the tie should not also be a vertical stripe pattern. Horizontal stripes or slanted stripes can work together as long as they are of a different size. Do: Feel free to branch out and try a pattern, like a floral print or repeating bicycles, instead of the go-to plaid, stripes, polka dots. Then, prepare for a copious amount of compliments. Don’t: Pair solid shirts with a tie of predominantly the same color, even if it is a pattern, unless there is minimal of the same color in the tie. This will make your shirt and tie visually “bleed” together. Keep it in the realm of light tie/dark shirt or light shirt/dark tie. Don’t: Wear primary colors (that’s red, yellow, and blue) together if you don’t want to look like a kindergartener’s art project. Do: Wear a black tie with a white shirt. It’s always a classic. Now, just don’t turn it the other way around with a black shirt and white tie (unless you are attending a throwback party of sorts). Let one pattern do the heavy lifting (but not more than one or you’ll have yourself a heavy weight match where both patterns lose). Start with a minimal color palette – and let one shine – to streamline the overall aesthetic. Uniformed patterns are easiest to pair together. If your polka-dots are different sizes and the plaid is too wild, you’ll have yourself a jumbled mess. Pro tip: small stripes + plaid, small polka dots + plaid, and small check + plaid are all can’t-miss combinations. Scale is everything. You can have some serious pattern play as long as each pattern is of a (noticeably) different size. Have we convinced you? Good! Now it’s time to dig into your closet, see what colors you already own, and start wearing them—on their own, or possibly together!